Instagram changed the way hashtag contests are run in December 2018. Now, Instagram hashtag contest entries must include both the contest hashtag(s) and an @mention of the Instagram Business Account running the contest. Learn more by reading Hashtag Contests & Instagram’s API Deprecation: What You Should Know. Facebook (which owns Instagram) announced today it has disabled several Instagram Platform APIs. 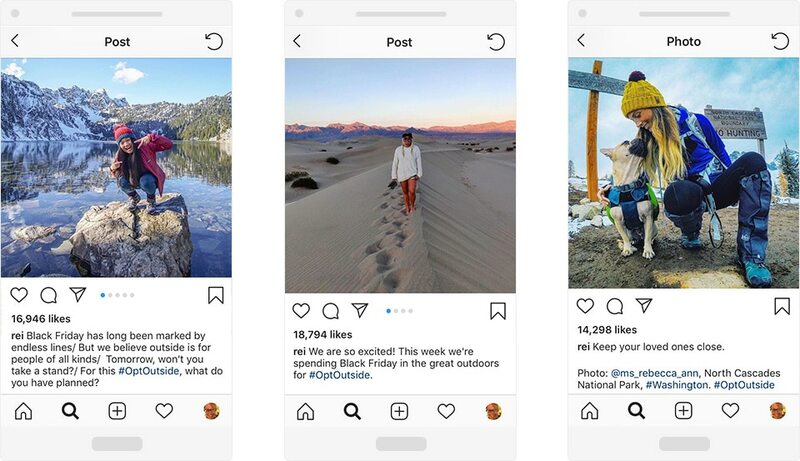 Third party Instagram apps will no longer be able to use APIs that provide access to follower lists, likes, relationships and public comments. What does this mean for you? When you ask people for permission to use their user-generated content — on Instagram — ShortStack will no longer be able to monitor, collect and store their replies. However, it is still a best practice to ask users for their explicit permission — you will now have to monitor and record their replies manually. Here is Facebook/Instagram’s announcement. Think you’re too late to start your holiday advertising and maybe even get some new initiatives out in the wild? You’re not! In fact, 70 percent of shoppers didn’t plan to finish their holiday shopping until well after Black Friday Week and the last Saturday before Christmas is called “Super Saturday” for a reason. Need proof that you still have time to get shoppers through your doors? 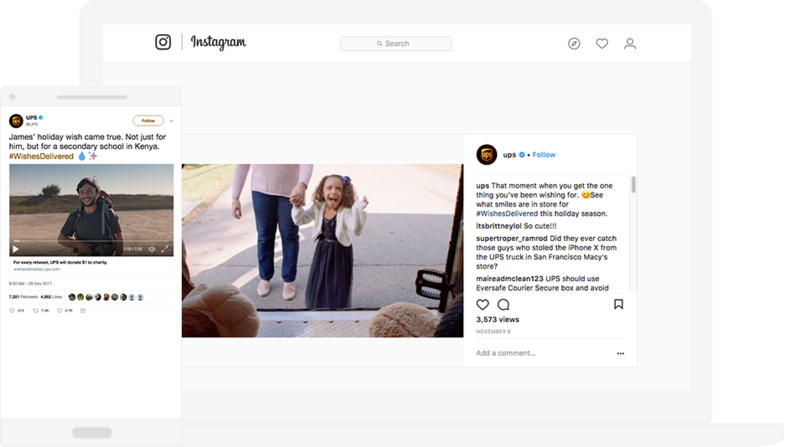 Just take a peek at any big brand’s Instagram, Twitter, or Facebook profile, and you’ll see images of snowflakes, gifts piled high in shopping carts, Christmas sweets, and a holiday-themed contest or marketing campaign. These people know what they’re doing. Want to create some social media marketing just like the pros? We rounded up some of the best holiday social media campaigns, and we created a breakdown of how you can set up your own Instagram and Twitter hashtag campaigns, user-generated content (UGC) campaigns/contests, and giveaway contests using ShortStack. With many hashtag campaigns, the goals are to boost brand awareness and to collect user-generated content to display on their social media profiles and elsewhere. Some of our favorite hashtag campaigns are the perennial campaigns from Starbucks, UPS and REI. These campaigns do not award a physical prize to the winner. Instead, top photos are featured on the brand’s social media profile, or elsewhere within their marketing. Every year, Starbucks designs holiday cups (I’m sure you’ve read about them a time or two!). An example of a clever hashtag campaign was Starbuck’s #GiveGood campaign. 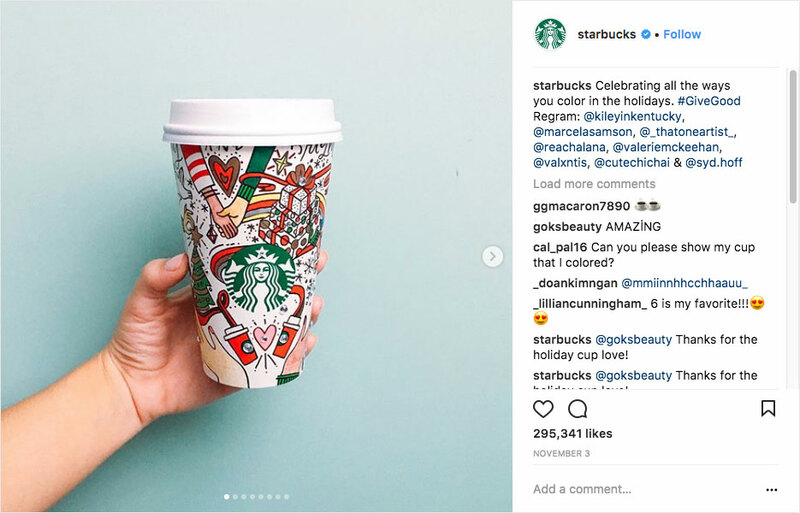 With the #GiveGood campaign, Starbucks encouraged folks to “make the holiday cup their own” and Starbucks fans who wish to show off their designs could post them on social media with the #GiveGood hashtag. Starbucks then chose submissions to feature on Instagram, Twitter, Facebook, their website and in other advertising. REI, the outdoor equipment and lifestyle retailer, started their #OptOutside movement by staying closed on Black Friday, but still paying their employees. In the last few years, the campaign has built quite the momentum with 15 million people and 700 organizations adopting the tradition to #OptOutside instead of shop. In its fourth year promoting the social media campaign, REI once again prompted their customers to make the same decision to enjoy nature on the busiest shopping day of the year. They encouraged folks to post their photos with the hashtag #OptOutside for the chance to be featured on the REI social media profiles and website. 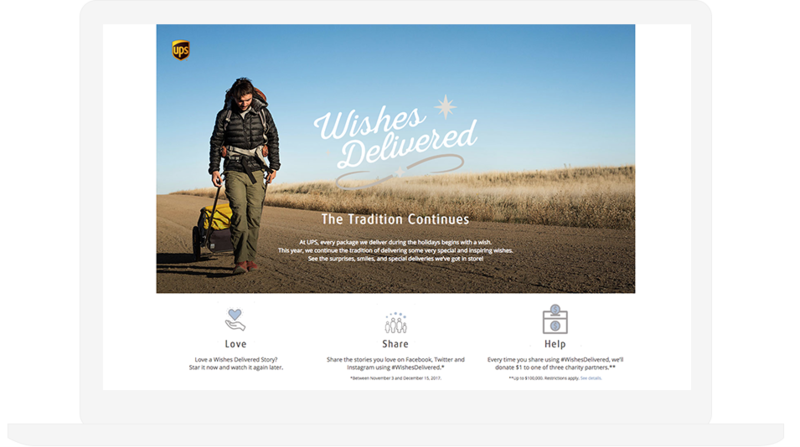 The #WishesDelivered campaign from UPS speaks to the spirit of the holiday season. UPS uses their #WishesDelivered campaign to promote good deeds during the holidays and showcase videos and stories where they have fulfilled a wish or delivered a surprise. (The stories are incredibly sweet, trust me.) People are encouraged to use the campaign hashtag to share UPS’s stores, or stories of their own. Plus, each time the #WishesDelivered hashtag is used, UPS makes a $1 donation to one of three charity partners. A way to ask submitters for the right to use their content. First, you need to use our Feeds feature (available on our Brand plan) to pull in posts from Instagram or Twitter with the hashtags you indicate. If you want to display all the entries in one place, such as on a standalone landing page or on your website, then you can use one of our templates. The Instagram Hashtag Giveaway template or Hashtag Customer Feedback template would work well. After you’ve set up your feed, it’s time to create a landing page that will act as the hub for your campaign. Within the landing page, you can display all of the submissions you’ve received from Twitter, Instagram and even a web form (if you want to give folks this option) in one place. Plus, if you are planning to run a contest like UPS’ where each post with a specific hashtag equals the donation of a dollar, then a landing page is the perfect place to show those fundraising totals. All you need to do is use the Entry Count Widget on your landing page to display the total number of entries to your contest. One of the most important parts of a hashtag campaign is getting the word out about your contest. Again, the landing page is essential. Your landing page gives you something concrete to link folks to when they’re first learning about your campaign. The landing page helps potential participants understand the goal of the campaign, why they should participate and how to participate. Aren’t sure how to promote your campaign? We have a bunch of great ideas for you here in our 40 Ways to Get the Word Out About Your Campaign blog post. Want to feature submissions you receive on your social media profiles, or for advertising elsewhere? Make sure you ask folks for permission to feature a post by commenting on the post you wish to feature. The user will respond with the hashtag you indicate if they release the rights to you. It’s a best practice to keep a record of rights requested and rights granted. Some of the best social media campaigns require people to put a bit of work into their entries. 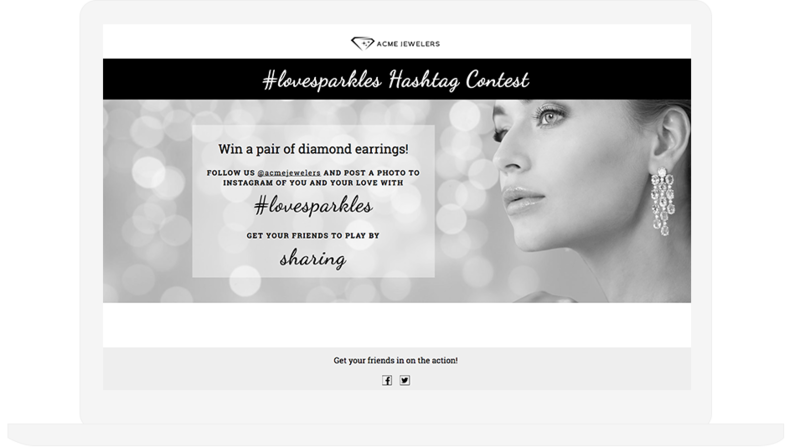 User-generated content contests incentivize people to create content related to your brand. The UGC you require might be a little more time-intensive when someone is entering a contest, at least when compared to a hashtag campaign with no prizes. With UGC contests, folks can submit their entries by including a hashtag with their post or by submitting their entry via a form. Sun-Maid hit the nail on the head with their #12DaysOfSunMaid sweepstakes. 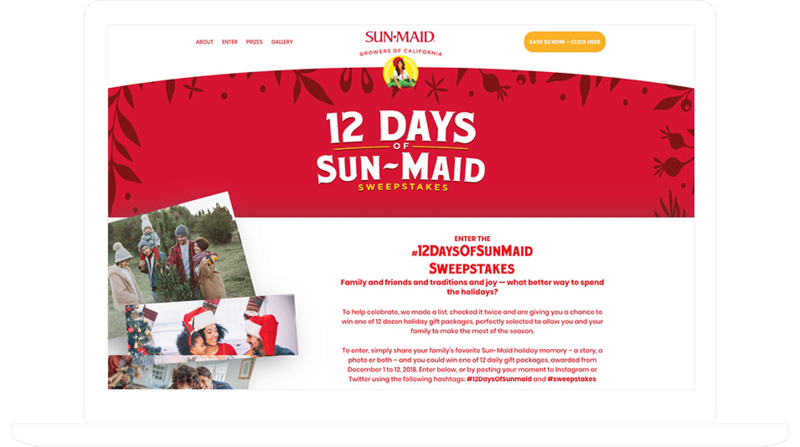 To enter, Sun-Maid is asking fans to simply share a family favorite Sun-Maid holiday memory – a story, a photo or both – by posting their moment to Instagram or Twitter using the following hashtags: #12DaysOfSunMaid and #sweepstakes. Winners win one of 12 daily gift packages. A way to choose a winner. First, you’ll need to set up a landing page. The landing page should include the entry steps you want people to follow, the contest details, a gallery of entries and the contest rules. The Instagram Hashtag Giveaway template or Hashtag Customer Feedback template would work well. Let folks know which hashtags they must use to enter, as well as what prizes are up for grabs. Be sure to include your contest rules on the landing page (here’s a guide and template if you need help writing rules). Next, you’ll set up the Feeds feature to pull in entries. You can display entries on your landing page using our Voting Widget. Just add the Voting Widget to your campaign, then select the list associated with your entry feed. You could leave voting enabled if you want folks to vote for a winner, or you can disable voting. Finally, when it comes time to choose a winner, you have two options. If voting was enabled, you could choose the entry with the most votes, or choose a winner randomly from the entries with the most votes. Another option is to choose a random winner from all of the entries use our Random Entry Selector. Don’t forget to announce the winner on both Twitter and Instagram! TIP: Want to collect a bit more information about entrants? Require them to submit their entries via a form! You can still require entrants to post their photo with a specific hashtag to Instagram, but they would need to use the form to submit their entries. The option to use an Instagram Photo Contest with entries submitted through form submissions instead of hashtags is available on all of our plans, as it bypasses the Feeds feature. An annual favorite, Office Depot’s Elf Yourself is a fun way to spread joy. People create a holiday video starring five of their friends as dancing elves. 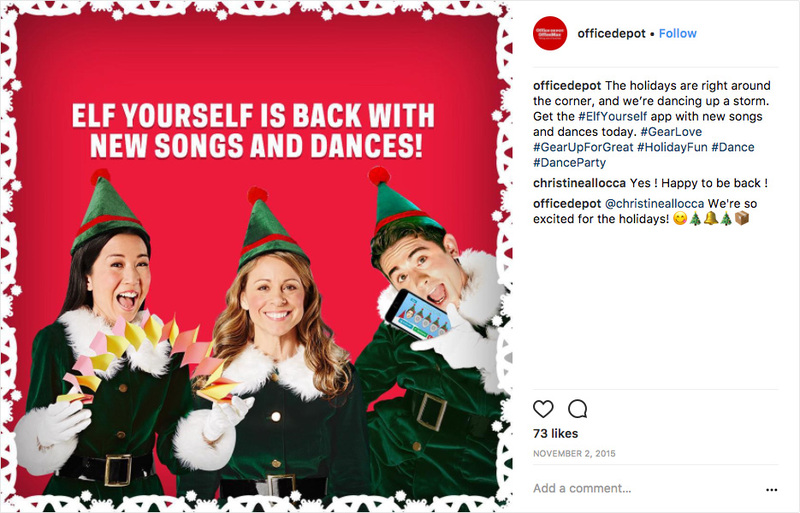 Office Depot provides the same video template for everyone, but the website visitor chooses the dancing elves’ faces by uploading photos of themselves and their friends. Once they have finished uploading the photos, Office Depot provides a link to the video so folks can share it with friends and family. The ability for people to share their entries. First, set up a landing page where people will both access your prop, or the directions they should follow to take their photo, and submit their entry. The Photo Contest template is a great option for this type of a campaign. The template includes a form for entry submission and a Voting Widget to display entries and allow people to vote. If you want to create a prop, be sure to include a link to a PDF of the prop for folks to download on your campaign. Next, give people the ability to share their entries. They will need to share in order to drum up votes, and voting is great word of mouth marketing for you. You can enable sharing after form submission and set it to display within each entry in the Voting Widget. When the time comes to choose a winner, use the voting results to determine the top five or ten entries, then ask a panel of judges to choose a winner from there. That helps to ensure that the top entry isn’t winning just because they have more friends. If you don’t want voting to occur, then use our Random Entry Selector to choose your winner(s). Swish upon a star and WIN. Share your stunning baths and your Christmas (s)wish on Insta tagging us @lushcosmetics and using #swishuponastar for a chance to win a trip for two to the Lush factory 🤗! Tag the friend you'd bring with you. 🌟✨🛁 . Full contest details in bio. Lush Cosmetics created a clever Christmas contest that featured their holiday bath bombs. Lush Cosmetics wants people to know that their bath bombs make for a pretty and luxurious soak, so they asked their fans to show off the bath art. Entrants were asked to share photos of their bath art created with Lush Cosmetics bath bombs, along with a caption of their holiday wish and the hashtag #swishuponastar. By asking people to post photos of their experiences to enter, Lush Cosmetics is creating brand awareness and promoting their products at the same time. Want to do something similar with ShortStack? It’s as simple as creating a hashtag contest! Just follow the hashtag campaign setup, but use our random entry selector to choose a winner. Looking for something simple? So are many big brands. A giveaway contest or sweepstakes is the perfect type of campaign if you want an easy-to-enter contest without requiring folks to create content of their own. Multi-day giveaways are everywhere around the holidays. The Holiday Giftaway by RetailMeNot is a great example. A new prize was released each day over a 12-day period. Several winners were chosen each day to increase the odds of winning, a great way to encourage more folks to participate. Also, RetailMeNot required people to enter each day to be eligible to win that day’s prize, incentivising people to visit their website day after day. Although this is not a hashtag contest, RetailMeNot used a number of popular hashtags to help promote their campaign, including #giveaway, #sweepstakes, #holidayfun and #holiday. Using hashtags in this way helps to spread the word beyond folks who are already following your brand. To promote your campaign using hashtags. Our Multi-Day Giveaway Calendar is one of our most popular templates for the holiday season. Each day, a new door is opened to reveal a prize. People must enter each day in order to be eligible to win the day’s prize. You can use our Random Entry Selector to choose your daily winner(s). To promote your contest on Instagram like RetailMeNot has done, you will need to include a link to the contest in your Instagram profile description. From there, you can post each day’s prize (or just a hint), or post about the contest in general. Not sure which hashtags to use? Our blog post featuring the 77 best hashtags for your christmas contest or giveaway was made for you. TIP: What to customize the functionality your Multi-Day Giveaway Calendar? Our Calendar Hacks blog post includes some of our most requested updates. BONUS: Use our Marketing Automation feature to send autoresponder emails to entrants after form submission, or to send some scheduled emails after the holidays. Check out this blog post for a ton of great ideas for holiday email marketing. The Body Shop’s win your wishlist campaign was a bit different from other hashtag contests. 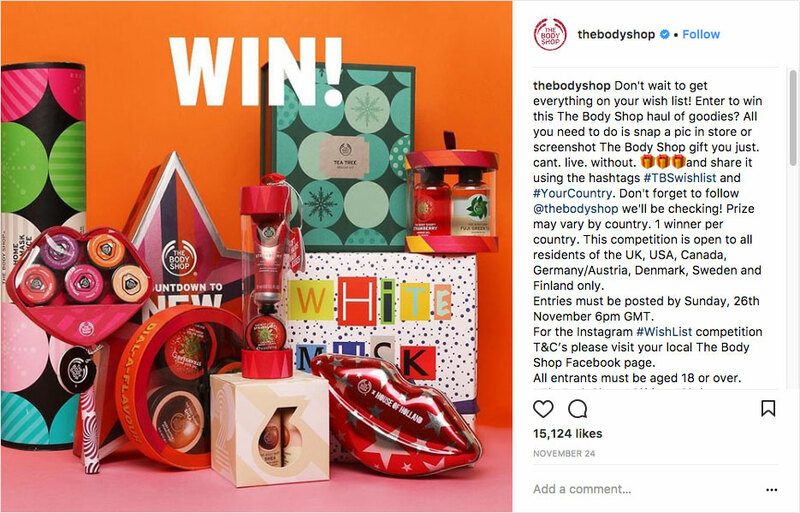 Instead of creating their own content, The Body Shop asked entrants to share a post by The Body Shop or a screenshot of The Body Shop merchandise, along with the #TBSwishlist and #country hashtags in order to enter. This campaign was a win-win for both The Body Shop and entrants. Entry was a lot easier for folks, since they don’t need to create their own content, and The Body Shop got some word of mouth marketing when people share their products. Plus, prizes were being given away in seven different countries; entrants simply included the country they are from as one of the hashtags. A contest like The Body Shop’s is easy to set up. Just follow the directions for creating a hashtag contest. If you want to differentiate between entries from different countries, states or cities, ask entrants to include their country/state/city as one of the hashtags for their post. Be sure to post about your contest on Instagram and Twitter using different products has images often, so people can have plenty of posts to share and screenshot. Bed Bath & Beyond’s “Oh, What Fun It Is To Win” holiday campaign pulled out all of the stops. For 47 days leading up to Christmas, they gave away fantastic prizes. The daily prizes were handed out by way of an instant win game where the winner knew immediately if they have won or not. 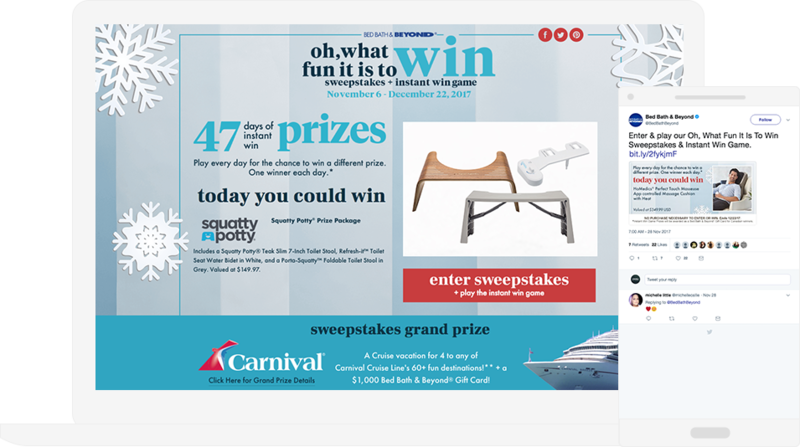 At the end of the contest period, everyone who entered during the 47-day period was entered into one giant grand prize drawing for a Carnival Cruise and a $1,000 Bed Bath & Beyond gift card. Get back to the basics by creating a Bed Bath & Beyond-inspired sweepstakes: Want to keep things simple? Create a sweepstakes to give away a single prize at the end of your entry period. All you need to do is use our Giveaway template. The Giveaway template includes a form, a way for people to share the contest, a place for your contest rules, and that’s it — simple as pie. At the end of the entry period, you can use our Random Entry Selector to choose a random winner. Interested in the Instant Win component? We have that too! Offer an Instant Win Giveaway in which participants know right away, whether or not they’re your big winner. Our Instant Win Template is available on ShortStack’s Agency Plan. IDEA: If you want to give away daily prizes, with a grand prize drawing at the end, check out our Multi-Day Giveaway One Form template. Entrants can submit daily to win each day’s prize, and each time they enter, they will receive an entry toward the grand prize drawing. That’s a wrap on some of the best holiday campaigns you can re-create for your own business this holiday season! See something else you like around the web, but not sure how to build it? Shoot us an email: theteam@shortstacklab.com and we’ll do our best to point you in the right direction.